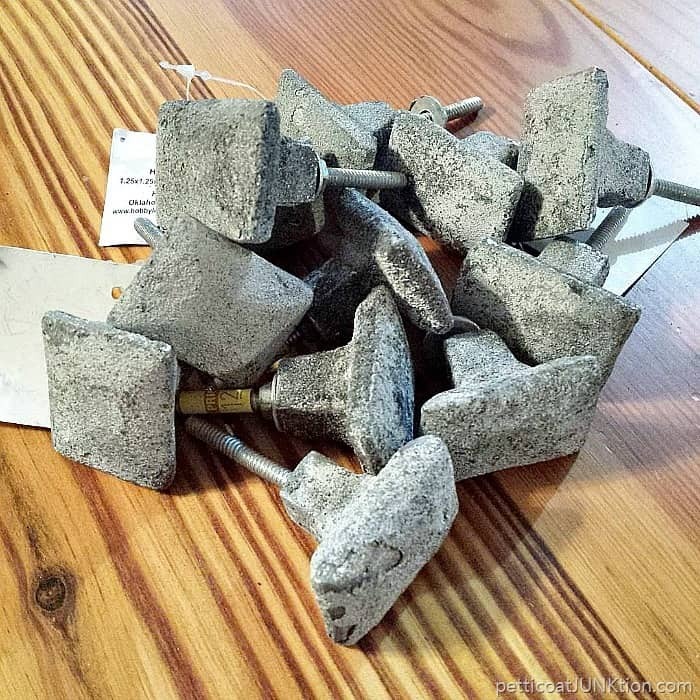 I love bargain furniture knobs. Heck, who doesn’t like getting a good deal. I lucked up on the knobs while looking for furniture pulls for the large chest of drawers I bought last week. I didn’t find knobs for that piece but I found these. They were on sale for $1.20 each. I wouldn’t have paid full price for them which was $5.99 but I would have paid half-price (the usual sale price). I really like them. I scarfed up most of the supply. 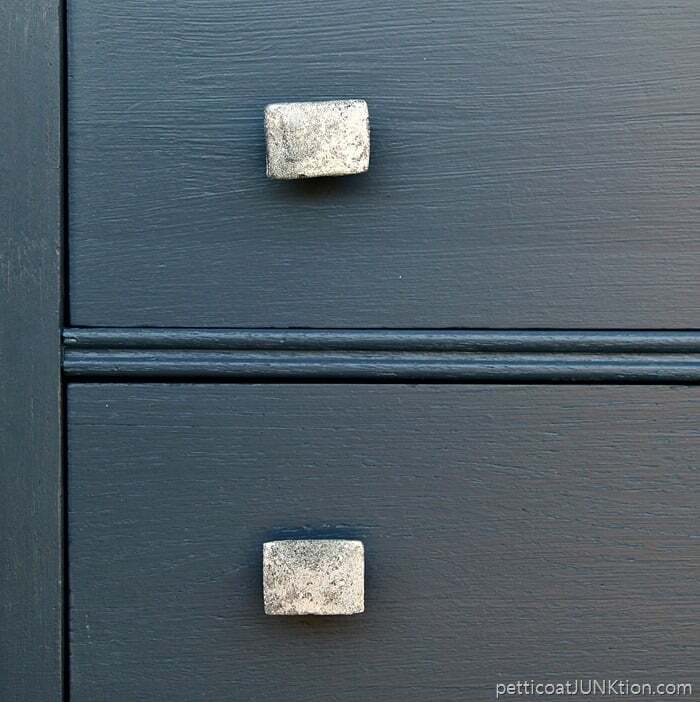 The knobs are shades of gray and textured. 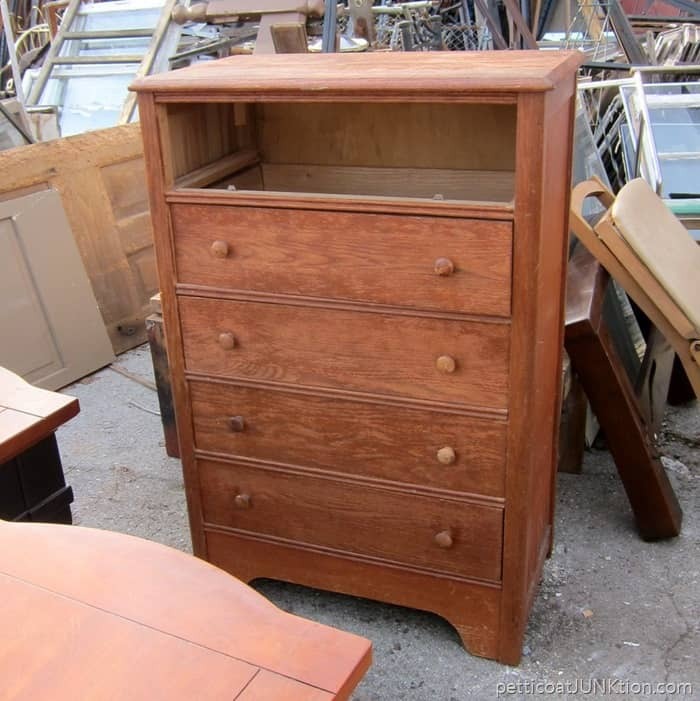 You guys remember the small chest of drawers I got last week at my favorite junk shop. The JTS took care of the missing drawer. 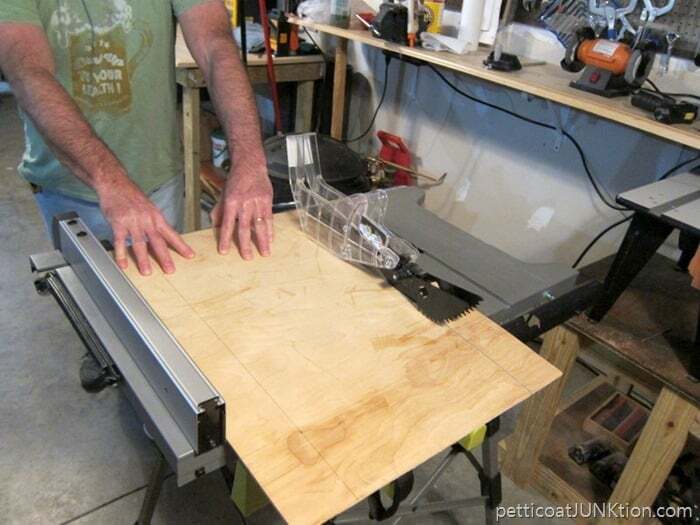 He measured and cut a shelf for the space. Then he stapled it in place. Couldn’t use the nail gun because it wouldn’t fit in that small space. I really had fun painting that area too. The bargain knobs! See why I couldn’t pass them up. 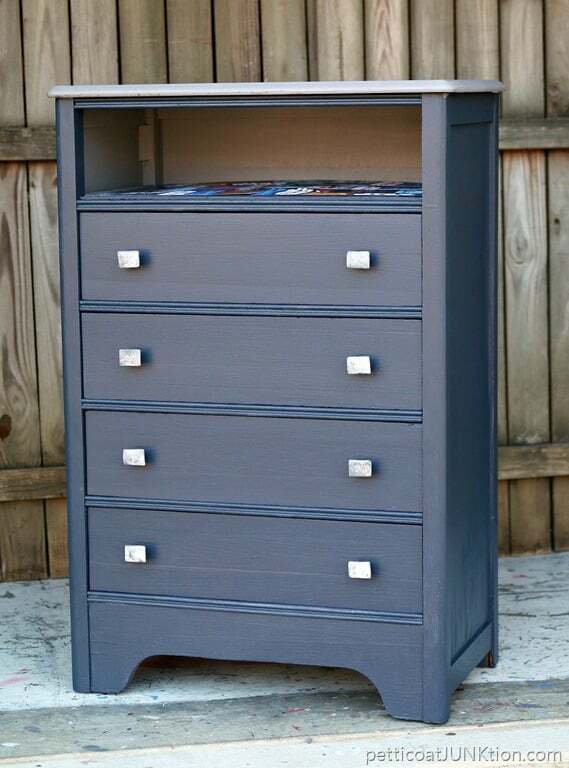 They inspired the paint finish for this chest. I was going to paint the chest a boring white and distress the heck out of it. Now I had a different plan. I pulled a can of paint off the shelf that had never been opened. I bought it to paint a piece for my sister but haven’t worked on that project yet. The furniture knobs say “boy” to me and what better color for boys than blue. I painted the shelf and the inside casing gray. 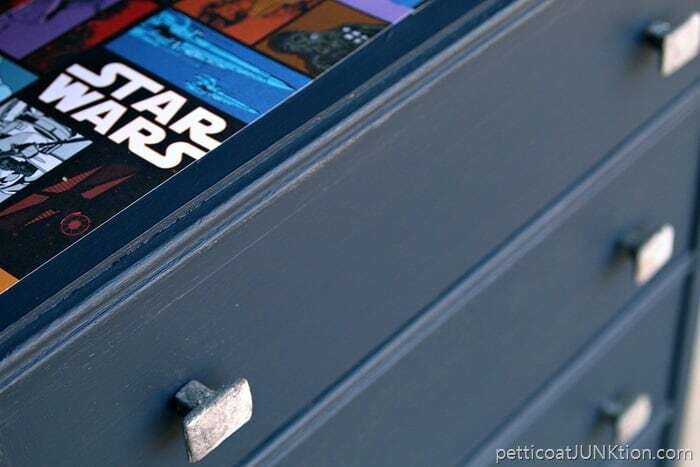 The Star Wars scrap book paper came from Hobby Lobby too. The paper is not adhered to the shelf. This piece is for sell so the paper can be changed out if the buyer doesn’t like it. Or it can be removed altogether. How about those knobs. I like them! I’ll share the paint process with the colors and type of paint I used later this week. I changed the paint plan half way through the project. I know you guys can’t believe that. Have a great day and I’ll see you later. Those knobs are awesome! Pinning to my before and afters furniture board! We would love to have you at our To Grandma’s house we go link party that opened this Wednesday morning and lasts all week! 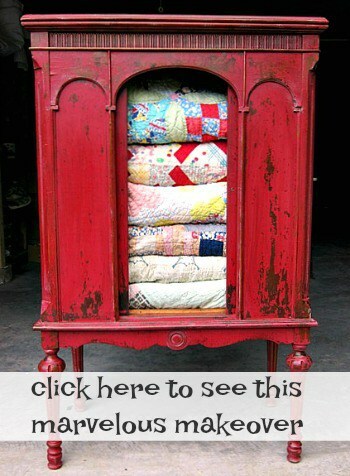 Love how you did the knobs add such texture and character to the piece. Knobs are great and the chest is such a great color! Love! Thanks for linking up at MerryMonday! 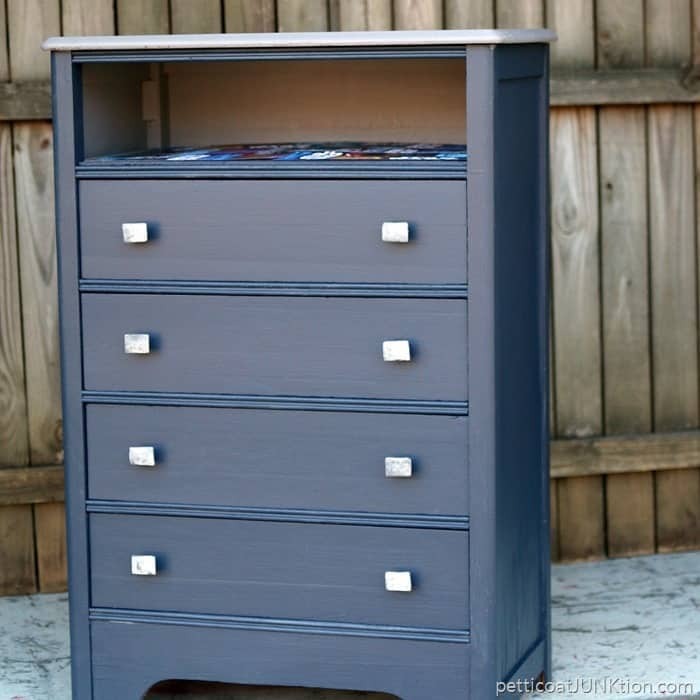 That is a very attractive dresser and the knobs are perfect! Some young boy will love it! A couple baskets of small stacks of books, etc. will be a good use for the missing drawer space. Good job Kathy and JTS! 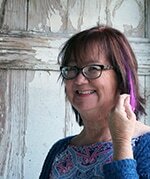 Kathy, thought you might like to know about a website called 99centknobs.com. They have a big variety of knobs and pulls at 99 cents each. Such a deal! You will be amazed at what they have. Hope you check it out. Let me know what you think. Saw this tip – thanks for sharing with the rest of us as well!! Hey Teri, Thanks for the tip. I just checked them out. Will probably be ordering! 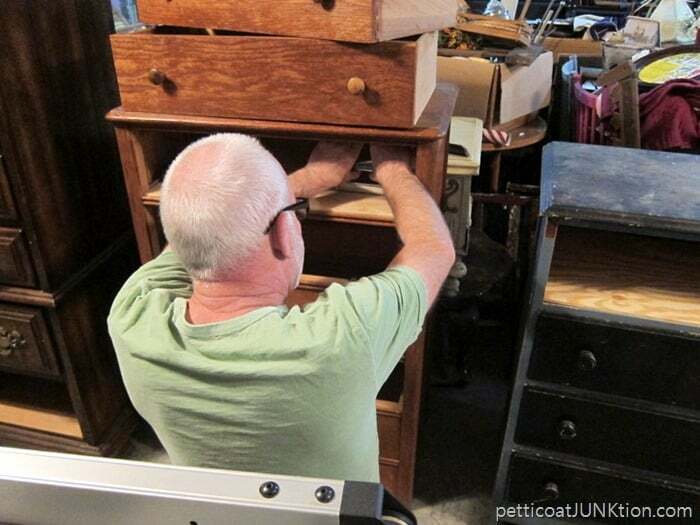 I really like it, but I think you should paint the wood inside the missing drawer space…. I like the knobs, also. You are right, that desk now cries BOY!!!! Very nice and I am waiting on your next project since I’m still cleaning after putting Christmas things away. I did make something for the front door and pleased with it.